. 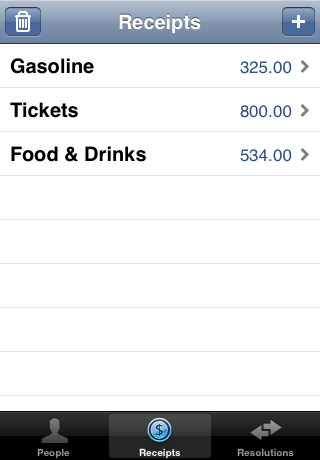 Shared Expenses is an application for iPhone and iPod Touch that allows you manage the shared expenses of an arbitary number of events, and to quickly resolve how to split the expenses for an event. The expenses from an arbitrary amount of receipts, can be split among an arbitrary number of people conviniently picked from the Contacts list, or entered manually. Optionally people can be exempted from an receipt, if the person should not share the cost. The resolution of who owes who, and what amount, to share the expenses even is one tap away. And the resolution can be e-mailed to the participants with a single tap more. Split a receipt into two receipt. Manage reimbursements for who owes who. If you are in need of support, have questions about Shared Expenses, or have suggestions for more features to add then send me an e-mail. You are also welcome to make a small donation. Donations will be used for coffe, snacks and anything else that keeps me happy for my coding session. If you speak a language that you think Shared Expenses should have a translation for then do not be shy, but send send me an e-mail and tell me what language you are willing to create a translation for. If you are then to translate Shared Expenses I will reimburse any cost you already have for Shared Expenses. I will also reimburse extra copies for close friend or family, as a token of appreciation for your work. Along with public credit. The text to translate is roughly 70 sentences, consisting of three words at an average. Translation for the presentation text in App Store for supported languages is also appreciated, but not required.